We are pleased to announce that Norfolk Broads Direct has become a Gold Investor in Wildlife with Norfolk Wildlife Trust. 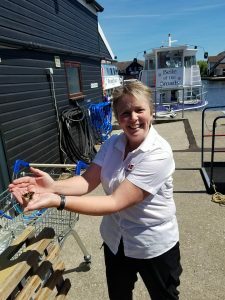 Rather fittingly, we have had wonderful encounters with some of Norfolk’s most iconic wildlife lately – much of which was in our boatyard! 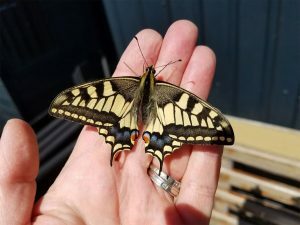 Topping the list was a Swallowtail butterfly, which landed on the back deck of the Queen of the Broads while our sister company, Broads Tours, was boarding passengers! Swallowtails are Britain’s largest butterfly and, as well as being very rare, are a species we are especially proud of because they only live in Norfolk. This is because the swallowtail caterpillar can only eat a plant called milk parsley, which can only live in our reed and sedge beds. Broads Tours crew member Donna, helped the Swallowtail to a quieter spot in the sunshine, where we were able to take this great picture of the magnificent butterfly. It’s large size can clearly be seen against the palm of Donna’s hand. 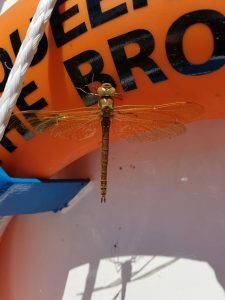 The Queen of the Broads must have a lucky streak as a few days after the encounter with the Swallowtail this stunning Brown Hawker dragonfly also landed on a life ring on the back deck of the boat. 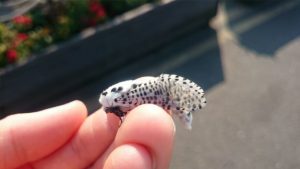 Another intriguing site in our boat yard was this Leopard moth caterpillar! Yet another exciting site from our boatyard was a magnificent Red Kite soaring overhead. The graceful bird of prey with a reddish-brown body, angled wings and deeply forked tail was saved from national extinction by one of the world’s longest-running protection programmes. While it is more frequently seen in the west of the country the birds appear to be gradually spreading into Norfolk! Despite all the great sightings from our boatyard nothing beats actually heading out on the water. And someone who certainly enjoyed a boat trip recently was one of our skippers Tobi who achieved the “holy trinity” of spotting an otter, a kingfisher and a marsh harrier all on the same trip. Tobi said: “The trip started well when, just ten minutes in, we spotted an otter towing a greylag goose – pausing for a minute we watched it pass and disappear into a boat cut. It’s always great in a trip to see one of the rarer species before even leaving the villages! “To make things even better, I then caught sight of a kingfisher flying across in front of one of our other trip boats, the Cordon Rouge, and heading off between the trees. “At this point, the trip was feeling really good – a nice sunny day and a kingfisher and otter under our belts with plenty of dragonflies and damselflies zipping around over the lilies. “What this meant to me though, was that we were now on for our ‘trinity’ of sightings. Whilst seeing an otter, kingfisher or marsh harrier on a trip is a joy both for us skippers, and also the passengers, it is quite a rare occasion to see all three on one trip. “The completion of the ‘trinity’ happened on our return journey, having lingered by Woodbastwick Marshes hoping for the lazy flight of a marsh harrier over the reeds and not having any success, we made our way back upstream. To my delight, as we approached Decoy Staithe, crossing in front of us, then flying low over the reeds was the dark shape of a female ‘marshie’. 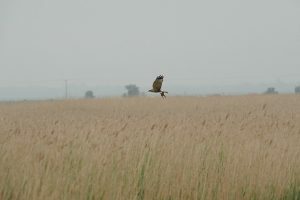 Taking a picture of a marsh harrier in flight can be quite a challenge, but a customer on holiday with us managed to take this staggering picture showing a marsh harrier carrying a rabbit it had caught. Customers have also loved watching lots of Great Crested Grebes rearing their ‘greblets’ on Salhouse broad. Most of the ‘greblets’ are getting quite big now with the adults taking them out into open water and teaching them to fish. However, there is still one grebe still on a nest at the bottom entrance of the broad as well as a recently hatched brood that have been carried around on mum’s back. The reason for these later arrivals is that grebes will often make several attempts at building a nest if their initial effort gets destroyed – so the ‘greblets’ hatched later in the year are often the result of their parent’s persistence. 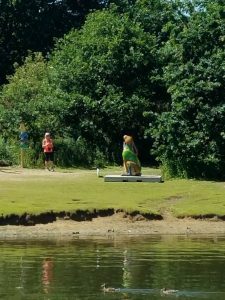 One rather less conventional site that hopped onto Salhouse Broad recently is a GoGoHare – named Warden Willow – which is part of the incredibly popular art trail that runs until 8 September to raise money for BREAK children’s charity. Sixty eight hares, each of which has been uniquely designed by local artists, are hidden around Norwich and Norfolk and thousands of children (and big kids) are jumping with excitement hunting them down on the trail. There is even a GoGoHares sticker book to collect each design! 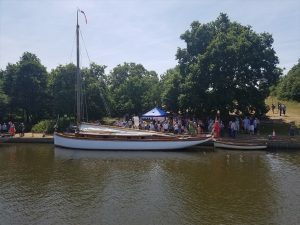 Warden Willow, who is sponsored by Hoveton Great Broad, arrived with great fanfare having sailed on the back of the Wherry Olive from Wroxham to Salhouse Broad, where crowds of people awaited the hare’s arrival! 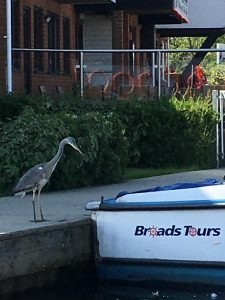 Customers are now loving mooring up at Salhouse Broad to take a close look at Warden Willow as well as admiring him from their vantage point on the water.